Credit rating agency Standard & Poor’s expects the Russian economy to turn to growth in 2016, adding 1.9 percent. This comes as a sharp revision to the previous negative outlook. S&P analysts expect economic recession of 2.7 percent for Russia in 2015, RBC reported on Monday. The agency’s previous report assumed a GDP growth of 0.5 percent in 2015 and zero growth in 2016. 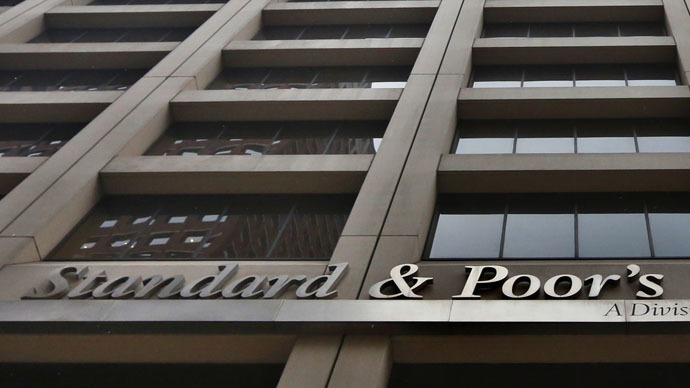 The main premise which has changed the S&P’s outlook for Russian economy was the assumption on the oil price movement, S&P analyst Irina Veliyeva told RBC, adding that the rating agency forecasts an average price of $55 a barrel for 2015 and $70 per barrel over the next three years. The forecasts for GDP growth and other key indicators have been revised as Russia's economy is dependent on oil prices, Veliyeva said. Inflation in Russia remains high and hit 16.9 percent annualized in March and 7.4 percent since the beginning of the year, according to Rosstat data released Monday. The head of the Central Bank of Russia Elvira Nabiullina said Tuesday she expected inflation to go down to nine percent by next March. “We think the scenario of reaching a mid-term target to reach four percent inflation by 2017 is realistic,” she said. The Russian ruble, which is a key indicator for the country’s economy, has been doing better than Brent crude. Oil has played a much less prominent role in the ruble’s exchangeratein the first three months of 2015. The US-based S&P’s forecasts are close to those from Russian authorities. The Russian Ministry of Economic Development expects a 2.3 percent GDP growth in 2016 and 2.5 percent growth in 2017/2018.The Central Bank’s forecasts are less optimistic – a 3.5–4 percent decline for 2015 and positive 1–1.6 percent in 2016. Nevertheless, the CBR expects growth of 5.5–6.3 percent in 2017. Meanwhile, the Central Bank of Russia (CBR) is going to move away from international ratings to Russian ones. "We are thinking about gradually moving away from international ratings and developing our own ratings industry with Russian agencies," Central Bank Governor Elvira Nabiullina said at the Russian Bank Association conference on Tuesday. She also added that the situation in Russia's banking sector was stable. The CBR expects a rapid decline in inflation reaching 9 percent in March 2016, Nabiullina said. Standard and Poor’s cut Russia’s sovereign rating to BB+ in January, leaving it below investment grade for the first time in a decade. In February, it downgradedthe long-term foreign currency ratings of Russian Railways, Gazprom, VTB and other big Russian companies and banks to a level right under the non-investment line.